Android fans looking for a decent tablet have had a tough time of it over the last couple of years. Since two-in-one convertibles became all the rage there have been next to no decent Android tablets hit the market. 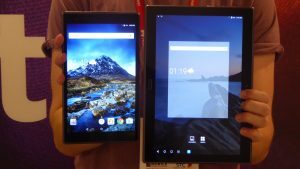 Those that have, such as the Google Pixel C and recently unveiled Samsung Galaxy Tab S3, have also generally been woefully expensive. Luckily this looks set to change in the very near future thanks to the arrival of Lenovo’s Tab 4; a series of affordable Android Nougat tablets designed with kids and parents in mind. The series includes basic 8-inch and 10-inch models, both of which are available in Plus configurations that feature improved components. Whichever version you choose, the tablet’s are seriously affordable with pricing for the bottom end 8-inch version starting at €169 (£144) and the larger 10-inch set to retail for €179 (£152). Above them the 8 and 10-inch Plus versions will set you back €259 (£220) and €299 (£255) respectively. Visually the regular and Plus versions are all but identical, which in my mind is no bad thing. Both have glass fronts and backs, use USB type C ports and have identical 7.15mm (8-inch) and 8.4mm (10-inch) thicknesses. Both also have identically sized batteries, with the 8-inch running off a 4850 mAh cell and the 10 a 7000 mAh. The design is pretty sleek and makes the Tab 4 tablets look way more expensive than they actually are. From what I’ve seen build quality is decent, though the glass did prove to be a smudge magnet during my hands on and I’m a little concerned how it’ll fare if left in the hands of young children. Parents looking for an tablet for under-10s would likely do well to invest in one of the “Pack” covers Lenovo’s made for the Tab 4. These include an optional Bluetooth keyboard “Productivity” cover and ‘Kids bump case’. The Nougat software has also been tweaked to have more advanced parental controls. The controls not only let parents manage what apps and content kids can access, they also have a nifty “on-times” and “down-times” scheduling tool. The tool lets the admin account decide what times certain apps or content can be accessed, which will be useful for any parent trying to limit the amount of Netflix their kids watch. There’s also a dedicated kids’ zone, that features curated “safe” content for children, but I couldn’t access it during my demo. All this sounds great, but I have some slight concerns about the basic Tab 4s’ hardware. Both the 10 and 8-inch version of the regular Tab 4 feature very basic specifications, being powered by a Qualcomm MSM8917 quad-core processor paired with 2GB of RAM and having a slightly hazy 1280 x 800 resolution display. The specs are fine if you’re looking for a dedicated tablet for young children, like the Amazon Fire HD 6 Kids Edition. But in my experience tablets and phones with these specs have struggled with demanding tasks, such as 3D gaming – though I didn’t get a chance to test this during my hands-on. The Plus versions of the Tab 4 offer far more robust specifications and in my mind are a far more compelling offer for most uesrs. Specifically both sizes of the plus run using a beefier Qualcomm Snapdragon 625, have 1920 x 1200 resolution screens, and are available in 3GB and 4GB configurations. The jump in resolution is noticeable and the screen generally looked sharper and was more pleasant to use on the Plus. The upgraded processor made the device feel faster, though I didn’t get a chance to run any intensive tasks on either version. The Plus versions also come with an upgraded Dolby Atmos set of stereo speakers that are louder and clearer than the basic versions. The more powerful Plus variants may cost more, but their improved components and screen resolution in my mind justify the difference and could make them an appealing choice for general bargain hunters as well as families. Hopefully both versions will deliver on their opening promise when Lenovo launches the Tab 4 in May. Check back with Trusted then for full reviews of the tablets. The post Lenovo Tab 4 appeared first on Trusted Reviews.